Sean Reynolds had tow of the 17 strikeouts by LumberKings hitters in Monday night's loss. CLINTON, IA (April 8, 2019) - The Clinton LumberKings dropped their first extra inning game of the year 6-5 in10-innings to the Quad Cities River Bandits on Monday night. Michael Donadio slugged the LumberKings (2-3) first home run of the year in a seesaw contest that featured five lead changes. Clinton struck first, wasting no time in pushing a run across in the bottom of the opening frame. Christopher Torres started the rally with a one-out walk and moved into scoring position with his second stolen base of the year. Two batters later Jerar Encarnacion lined a single into right that gave the LumberKings a 1-0 lead. The lead changed hands for the second time of the night in top of the third with the River Bandits (1-3) first runs of the game. Following a throwing error by Clinton third basemen Marcos Rivera, Emmanuel Valdez capped the rally with an RBI double. Both runs in the inning were unearned and would be the only allowed by LumberKings starter Manuel Rodriguez. Over his five innings of work he struck out four, walked one, and was given a no decision for his time out. Donadio put Clinton back on top in the fourth inning. With one out in the inning Rivera double off the wall in straight away center and scored four pitches later on a Donadio home run to right-center field. The blast was the first as a team for Clinton and put them back on top 3-2. Quad Cities tied the game in the sixth on an RBI single by Jonathan Lacroix and reclaimed the lead in the following inning. In a 3-3 tie, Valdez collected his second and third RBIs of the night with a two-run homer to right that cleared the Lumberlounge. The score remained 5-3 until Donadio drove home two more runs in the bottom of the eighth. Clinton loaded the bases with one out in the inning to force Mark Moclair from the game. Willy Collado entered for Quad Cities and struck out the first batter he faced before allowing a two-run double to Donadio that tied the game at five. The River Bandits broke the tie in the 10th - scoring their free base runner that began the inning at second - off Clinton reliever C.J. Carter (0-1). Collado (1-0) preserved the one-run lead in the bottom of the inning to earn his first win of the year. 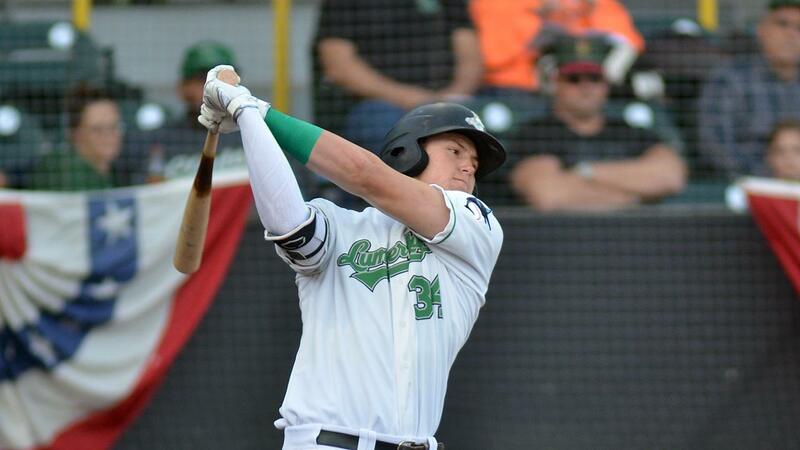 The LumberKings will play game two of their four-game series with the Quad Cities River Bandits on Tuesday night. Clinton will give the ball to righty Chris Vallimont (0-0, 0.00) while Quad Cities will counter with right-handed pitcher Austin Hansen (0-0, 0.00). Tuesday will be the first "Two Dollar Tuesday" of the year. Come down to the ballpark for $2 tickets, $2 box seat upgrades, $2 select beers, $2 soft drinks, $2 hot dogs, and $2 ice cream.